It's official: Ryan Secrest is joining the NBC Family. Will he take Matt Lauer's job? No… not yet. First the American Idol host and producer of Keeping Up With The Kardashians will show up on your TV in primetime as part of NBC's coverage of the London Olympics this summer. But come on, we all know that this is just the first step in a journey that will make Ryan Seacrest the new host of Today. Matt and Ryan can heh-heh and joke all they want to, but RyRy is being groomed for something bigger, that much is clear. "Do you see yourself doing a job like this?" Matt asked Ryan. Ryan said he didn't know. 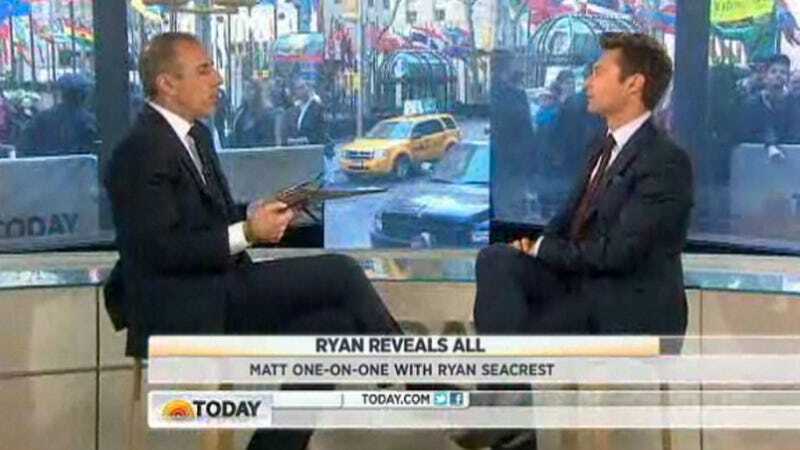 Then Ryan made it seem like Matt is about to resign any day now, asking, "How long will you be on the Today show?" But the weirdest part was when Matt said, "I think you'd be great at this job." You're glib, Matt. Glib. That is basically saying: This job is not about journalism, dude. I know I have interviewed President Obama and Vladimir Putin and George Bush and so on, but I also dressed up as Jennifer Lopez. To do this job all you need to do is be a mild-mannered white guy with perfect teeth, and you, Seacrest, could definitely do it. As could an animatronic Ken doll, or Max Headroom. But anyway! Ryan will be joining the folks hosting the Olympics. Hope you like your gymnastics and track commentary real bland.